But what if I told you that finger foods can make for some great dinners, too? Today, I am joined by a group of talented bloggers from the Sunday Supper Movement to demonstrate how finger foods can be just that. My contribution to this event is a Vegetarian Piadina Sandwich. 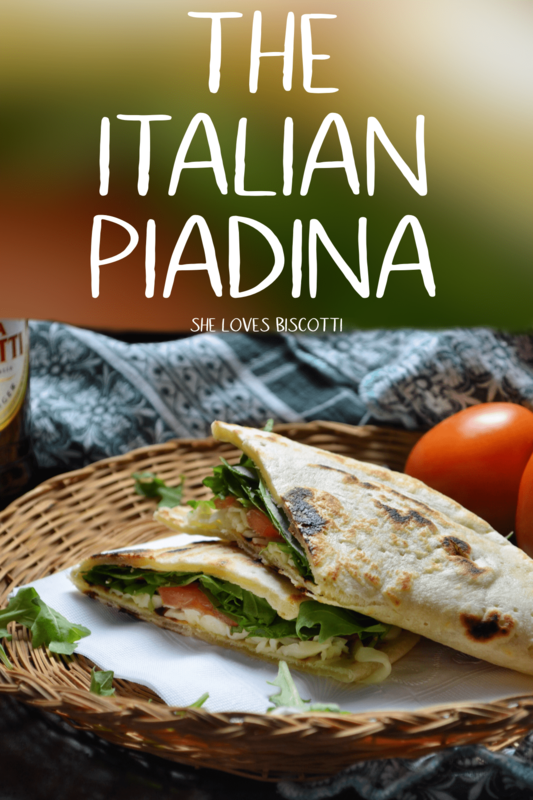 The piadina (pronounced PEE-UH-DEE-NAH), as you may know, originates from the picturesque Romagna region of Italy. This would be the Central-North area of this famous boot-shaped country. The piadina (also referred to as piada) is categorized as a flatbread. Did you know that flatbreads are considered one of man’s oldest foods? They can be found in all cultures – some examples of flatbreads include naan bread, lavash, pita bread, matzo bread, and, of course, the ever-popular tortillas. 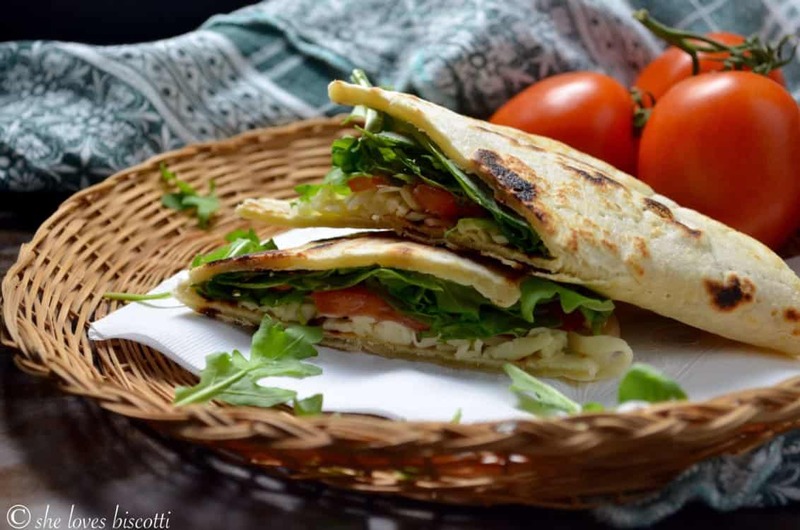 The piadina (like other flatbreads) was originally considered peasant food, as only basic ingredients were required: flour, a source of fat (lard or olive oil), water and/or milk, and salt. 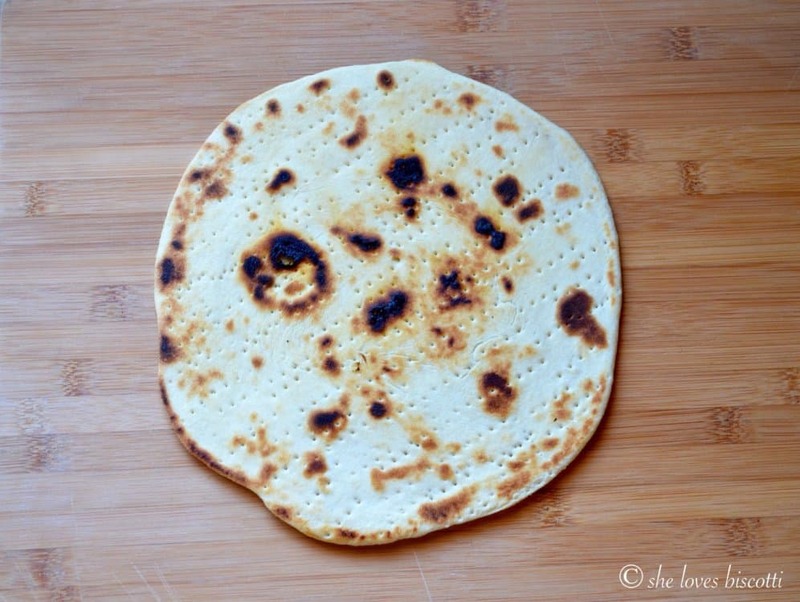 Although usually an unleavened flatbread, some piadina recipes will include baking powder. This will result in a slightly thicker piadina. In the small town of Montetiffi, located in the Emilia-Romagna region, you can still find at least one family that continues to make the traditional round clay pan, referred to as a teglia, used to cook the piadina. The teglia pan will definitely provide you with an authentic taste. Unfortunately, I do not have one of those pans, but as you can see I still managed to get some characteristic dark blisters and a great tasting piadina with a cast-iron pan. A non-stick pan or a griddle pan can also be used. I am confident that you can also obtain great results with a comal. While cooking your piadina, use your fork to prick the dough to remove any air bubbles that appear. After they’re cooked, stack them up until ready to be topped with your favorite fillings. No utensils required. Just fold the dough in half and eat as you would any sandwich. The ultimate finger food! Piadina can be transformed into sweet (did someone say Nutella?) or savory (usually a combination of cheese, cured meats and vegetables) eats. Truth be told, you can fill your piadina with just about any combination of food. Just think of the piadina as your canvas… and create! Since the theme for this Sunday Supper event was finger foods for dinner, I thought it would be great to share one of my favorite fillings for this flatbread: Shredded mozzarella, aromatic arugula and juicy tomatoes. But there are soo many foods that can be used… grilled vegetables, sauteed garlicky Swiss chard, ricotta (or any kind of cheese!) – you are truly only limited by your own imagination. I’ve adapted the recipe for this Vegetarian Piadina Sandwich from a recipe I found in La Cucina Italiana. When I first got married, my husband gifted me a wonderful subscription to this Italian food magazine. At the time, I wasn’t sure if it was because he truly understood how much I enjoyed cooking or if he was hinting that my food could use some improving 🙂 Nevertheless, something worked, because after 32 years, he is still my official recipe taster and pot washer, so it’s all good. I adapted the piadina recipe as a vegetarian recipe. I basically substituted the lard with olive oil. The olive oil will result in a piadina with a lighter and crispier texture whereas the lard (or even butter) will create a softer, denser texture. Just in case you are interested, the original proportions of the ingredients are: 500 grams of flour; 250 grams of water; and 50 grams of lard. Of course there is the pinch of salt and, if using, some baking powder. So, get your fillings ready for your finger food piadina party! Then it’s just a question of gathering round the table for Sunday supper and enjoying the company while you are eating your Vegetarian Piadina Sandwich. 🙂 What will you put on your piadina? In a large mixing bowl (of a stand mixer) combine the sifted flour and baking powder, with the olive oil, water, milk and salt. With the dough hook attachment, knead for approximately 10 minutes (the dough should pull away from the sides of the bowl). Alternatively, knead by hand. Transfer the ball of dough in a bowl and cover with plastic wrap. Allow to rest for about 30 minutes at room temperature. Can also be refrigerated overnight. Divide and shape the dough into 4 balls (approximately 120 grams each). Dust wooden board with flour. With a rolling pin, roll out each ball of dough into an 8 inch round disc -about 1/8 inch thick (or desired thickness). Continue to roll out the other balls of dough (discs can be stacked, separated with a piece of parchment paper). Heat a large cast-iron or non-stick pan over medium -high heat. Can also use a griddle pan. Lightly brush the pan with olive oil. Add the rolled out piadina and prick with fork to avoid air bubbles. Cook until charring occurs, about 1- 2 minutes. Turn over and continue to cook for an additional 1-2 minutes. Transfer cooked piadina to plate. Repeat until all dough has been cooked (At this point, dough can be stacked). Serve immediately (while still warm) with your favorite fillings. During the idle time of 30 minutes, you can prepare your favorite fillings. The piadina are at their best as soon as they are made. Every Sunday, there is a wonderful group of bloggers called the #SundaySupper tastemakers that collaborate together on a theme. Today’s theme was Finger Foods for Dinner and I think you’ll agree the line-up of recipes is amazing! I would like to thank my mentor: Foodie Stuntman of Crazy Foodie Stunts and the event host for this event: Christie Campbell of A Kitchen Hoor’s Adventures. If you have a chance you should really check out these great finger food recipes contributed by these wonderful food bloggers. LOVE THIS! It’s like a sanwich bar! Just make the bread and have the toppings, and people can make whatever sandwich they want. This is an awesome idea! The piadina is just awesome Christie! Enjoy 🙂 Appreciate you taking the time to comment. Looks delicious. Interesting that I just read another article about this sandwich about 2 weeks ago and here you are with the recipe. Good timing. Thanks. And, the #SundaySupper group sounds like an amazingly talented group. I love a sandwich full of veggies! Delish! Totally from scratch flatbread sandwiches. So fresh and delicious! These look fantastic and I loved reading about their origin. I wish I had one right now.